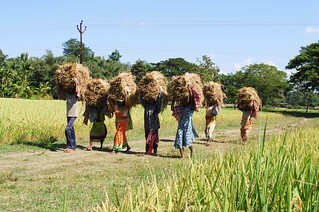 It is rice harvest season in India. Never ending carpets of green fields are turning gold in India’s fertile flatlands. In the occasional acre, contracted field hands spend backbreaking days manually reaping and threshing the grain by swinging bundles of rice straw over their heads to beat them down on a large barrel. Traverse the Grand Truck Road through North India and find harvesting machines called combines frequently dotting the horizontal landscape. The large mechanical boxes move at a brisk pace across parched rice paddies, eating up the field like a giant insect and leaving destroyed straw stumps in its wake. A few days later, the sky turns hazy, the air develops a strange pungent flavour, and it begins to rain unrecognizable small white scraps. It is ash. Plumes of black smoke rise from a different direction each day, as farmers burn entire fields to get rid of rice stems and residue. From an airplane window, the scorched earth looks like a war zone. Flickr/ Caisii Mao. Some rights reserved. India turns black twice each year, as harvested fields blaze across the Indo-Gangetic plains in April/May for the wheat crop and again in October/November for rice. Wheat and rice, the main staples of South Asian cuisine, are harvested manually or by a combine. Manual labour is costly and time-consuming, and farmers increasingly turn to machines to meet planting schedules. Leased locally from business centres, combines reap rice fields in only a few hours, work that once took several days. However, the combines leave much of the rice stem and root behind in the soil as it harvests rice from the plant, which farmers remove by lighting fires to quickly level the fields for the next crop. This practice is yet another inevitable by-product of the increasingly obsolete yet enduring era of the Green Revolution - policies of the 1970s that conveniently provided national food security at tremendous environmental costs to agricultural states. Facilitated by the mechanization of agriculture, the rice-wheat cropping system became a dominant cropping system with the government sponsored inception of genetically modified, high yield varieties of rice and wheat that required excessive amounts of pesticides and water. In the Punjab state, the home of the Green Revolution and breadbasket of India, four decades of these intensive farming practices have resulted in contaminated groundwater and rising numbers of pesticide-related cancer. Water tables have also reached alarmingly low levels, with the state mining its groundwater at an unsustainable rate. There is no doubt that machines such as the combine have streamlined the grain harvest, but their ineffectiveness in grain residue removal have left the average farmer with little option other than fires. In Uttar Pradesh, a state that produces and burns the most residues in the country, medical professionals describe a steady rise in respiratory diseases in increasingly younger adults or children. The fires also affect the lives of animals or birds and destroy beneficial insects as well as topsoil nutrients, which then must be replenished with toxic fertilizers. Burning residue emits large amounts of greenhouse gases that are closely linked to global warming. Studies in several states now report decreased long-term crop yields as a result of regional climate change caused by mass open field burning. Unsurprisingly, India is the third largest contributor of carbon dioxide in the world, behind China and United States. On the global stage, India is also a vocal promoter of the environmental standards laid out by the Kyoto Protocol, but is exempt from having to comply with them as a developing nation. Like state directives banning open field burnings that go unheeded by its farmers, token legislation is passed at the federal and state level but largely unenforced. Agricultural departments at public universities, once set up by the architects of the Green Revolution to promote its policies, are now redirecting research to solve the ensueing traumas. The Happy Seeder, a seed drill that allows farmer to plant a subsequent crop without getting rid of residue from the previous one, is one product of academic research. Eager state governments have endorsed the drill. However, despite the Seeder’s theoretical potential, its high cost makes it unaffordable for the average farmer and is not expected to replace open field burning. Efforts at the local level are more hopeful. Where available, environmental groups now promote biomass power plants as alternatives to burning. Most farmers are unaware that grain residue can be sold to biomass centres or sugar factories to be recycled into biofuel. Local non-profit groups also advocate organic agriculture to reduce pesticide and water use. Dr. Vandana Shiva, an environmental activist who fought the corporate biopiracy of native seeds, has set up thousands of genetically unmodified seed banks to promote a return to natural farming and biodiversity, and founded a college in her home state of Uttarakhand to educate farmers about sustainable living and practices. While farmers are adopting methods of holistic living through localized advocacy, active government action and changes in legislation is still required for permanent transformation of the status quo of India’s farming industry. It is ironic that India’s food security is now at risk from the same policies that helped establish it half a century ago. Prolonged pesticide use has contaminated soil, water, and food produce. The country is running out of groundwater for consumption and irrigation. Global warming, and respiratory diseases are direct the result of burning wheat and rice residues due to a local mindset for whom the practice is nearly tradition and an economy that silently encourages food production at any cost. However, this practice is hardly restricted in its impact. The fires that rage biennially are a warning bell for India and its 1.2 billion Indians of a potentially impending water, agricultural and environmental crisis. One that, if ignored, could soon sound a death knell.